We had a big rainstorm here yesterday. When I walked into my local Gamestop, soaking wet, I said, "Ironically, I'm looking for Heavy Rain." The employee did not laugh. Foiled again! -The PAX schedule has been announced! Lots of interesting stuff on there. Having not been to this kind of thing before, I'm not sure how early I need to show up at the panels I want to see, though I'm suspecting they won't be the most popular ones. I'm instinctively passing over things I know will be heavily attended, like the PA panels and the keynote, but I don't want to miss the journalism panels. I'm already building a stockpile of spitballs to throw at Croal and Totilo. -Sparky Clarkson has one of the most cogent takes I've seen about why No More Heroes 2 is diminished by not having an overworld. Speaking of the first game's rendering of Santa Destroy, he says "the city serves the purpose of the game. It creates a sea of banality for Travis (and the player) to escape from into the vibrant world of the assassin rankings. The city helps to characterize Travis as a loser. And the city says something interesting about other open-world games." That's dead-on. And without that counterpoint, the sequel doesn't seem nearly as savagely satirical. -I gave up on Modern Warfare 2 long ago, for many reasons, but I still appreciated L.B. Jeffries' rigid analysis of MW2's multiplayer map style. His key insight: in this game, the map is a weapon. That certainly explains my uncanny ability to get shot by opponents I couldn't see. -I'm only a few hours into Heavy Rain at this point, and I have to say I'm enjoying it quite a bit. Despite its healthy Metacritic score, I've been surprised both at the volume and the ferocity of the criticisms I've read of the game on message boards, blogs, and Twitter. One of the more balanced criticisms comes, naturally, from the Brainy Gamer, who says that he finds Heavy Rain to be at cross-purposes. I think there's room to like or dislike the game, and plenty of complaints to make about it, but frankly I think a lot of the complaints I've read -- not at the above link -- are misguided. I'll say more about that next week. Links! Getcha hot links here! -News that Activision CEO Bobby Kotick regrets buying Red Octane instead of Harmonix is no suprise. What is a surprise is how little he seems to have thought about it at the time. Stephen Totilo quotes Kotick as saying, "We really didn't even think, 'Hey we should go to Boston, and meet these Harmonix guys and see what they're up to.'" I don't think it's with the benefit of hindsight to point out how stupid that was. On the other hand, nobody in the music-game business is exactly flush with cash at the moment. This week, the Boston Globe reported that Harmonix may have to pay back some of the $150 million bonus they received from Viacom in 2007. The sad part about all this is that it was so obvious what was happening as it happened. There's still a strong future for music games, but the market got oversaturated, and we won't lament the loss of these excess SKUs. 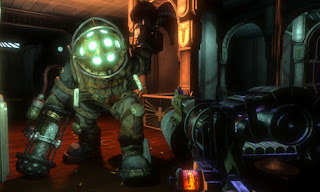 -Great essay at Ta-Nehisi Coates' Atlantic blog about the politics of Bioshock and BioShock 2. Looks like somebody named "A. Serwer" wrote the post, rather than TNC himself, which I say in order to give due credit. Some of the greatest praise you can give to the BioShock games is that a post like this doesn't seem like it's overreaching to find relevance in them. I don't even have anything to add to it. -The upcoming Game Developer magazine has a port-mortem of my favorite game of 2009, Borderlands, and GameSetWatch has kindly excerpted some of it. It sounds like Borderlands had a tumultous development, even more so than most games, so it's all the more amazing that they ended up with such a great final product. You wonder what they'll be able to do with the sequel, having laid down such a solid foundation. -Another great Hardcasual piece this week, "StarCraft II Beta Puts South Korea in Economic Freefall." How do you know it worked? I shared it in Google Reader and somebody said he thought it was a real headline for a minute. -Steve Wiebe has reached the mountaintop once more, setting a new world record for Donkey Kong Jr. You may remember Wiebe as the good guy in the incredible documentary King of Kong. I know a lot of people have accused the movie of playing a little fast and loose with the facts in order to tell a more compelling story, but it's a terrific film all the same. I've played four new games so far in 2010, and three of them have been sequels. I sometimes fall into the trap of complaining that publishers are too quick to pick the low-hanging fruit of existing franchises, rather than trying to establish new ones, but a well-executed sequel seems more common in the world of video games than other media. 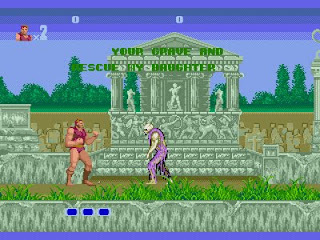 Games build on their predecessors in many ways, by taking what works and altering what doesn't. This doesn't always result in a better product, but more often than not, making a good game results in keeping one eye on the past. Still, it's strange how some sequels that seem necessary can blow it, and some that seem unnecessary can end up feeling vital. The most interesting thing about the sequels I've played is that two of them seemed like no-brainers, and turned out to be disasters. And one of them seemed like a terrible idea, until it proved that good play mechanics will always justify a game. With sequels, as with anything, you can't pre-judge. Here's a look at what these sequels attempted, and how they fared. Why it was a good idea: The first Army of Two was an uneven shooter with enough good ideas that a sequel seemed like a slam dunk. That game attempted a satirical storyline that was ballsy in its invocation of timely, real-world events, and snuck in a subversive sense of humor under the radar. But as a shooter it was only so-so, lacking big-money moments and feeling repetitive even well before its running time ended. If the developers could have polished up the gameplay, the sequel could have been a big winner. Why it didn't work: Taking exactly the opposite approach, The 40th Day jettisoned what worked and kept what didn't. Gone was the humor, and the more overt and risky topical references. Still there were the uninspired arenas that felt articial and forced. The sequel even messed up the controls, making it next to impossible to do something as simple as heal your teammate. A sequel is a great chance to refine and iterate, but the opposite happened here. Why it was a good idea: No More Heroes could barely contain all its ideas. It was so funny, fresh, and original, you'd be forgiven for assuming that this franchise could lay golden eggs. I figured Grasshopper Manufacture could get up to No More Heroes 10 and still be surprising me. I was ready to follow this game anywhere. Why it didn't work: Desperate Struggle ends up feeling like the contractual obligation album, delivered without much care or attention. It makes overtures to some of the misguided criticisms of the original, which diminishes it. It's funny, but not nearly as sharp or trenchant in its commentary as the original. And the addition of a new playable character that winds up not feeling so playable is just the nail in the coffin. Why it was a bad idea: The first game was close to perfect, a single-player adventure that was artistically adventurous, philosophically challenging, and hell of fun to play. A sequel seemed like a bad idea not just because there was no way it could be as good as the original. Rather, BioShock seemed so self-assured and hermetic that it was hard to imagine how BioShock 2 could be anything but a cash-in. I mean, multiplayer? Really? 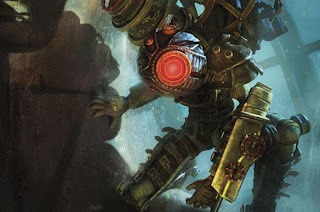 Why it worked: The world of Rapture may have been more fertile ground for storytelling than it seemed. Just being back there is a pleasure, and the new antagonist, a collectivist counterpoint to Andrew Ryan's rugged capitalist, is as good an idea as any. But the biggest thing BioShock 2 has done is remind me how much fun the first game was. In the years since BioShock came out, I've tended to think about it only in terms of the setting, story, and themes. But it was a blast to play! So is the sequel. The plasmids, the retro weapons, and the numerous combat styles are as good as ever. Really, the notion of BioShock as this singular work that sprang, fully formed and perfect, into existence is a bit off. 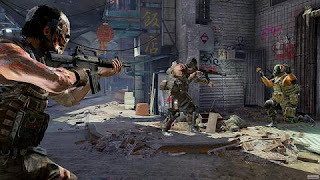 Though it was technically a new IP, it was building on the ideas of several thinking-person's shooters that had come out in the previous decade. In its own way, it was a sequel, too. * Almost all games are. That's why we need them. *And the non-sequel I played, Bayonetta? Hard to argue that it could have existed with the Devil May Cry series pointing the way. -If you haven't been keeping up with Gamer Melodico, a new site led by Kirk Hamilton, one of the nicest guys on the internet, you should. This week he posted a hilarious video of Commander Shepard's anti-press tendencies. Hasn't this guy ever heard of the first amendment? -Mike Walbridge has some advice for aspiring game writers: give up. Mike's not wrong on most of his points. It's hard enough to make any money writing about video games, never mind make a living off of it. The competition is fierce. It's a constant battle to get paid what you're worth when there are thousands of other people out there willing to work for less. And yes, writing about games changes the way you play them, which is not always for the best. It's all true. But it's also true that if you love writing, and you love games, and you feel like you have something to say, you should say it. Maybe nobody wants to pay you, or publish you. Say it anyway. Start a blog. Write for the love of writing. It's not always easy, and sometimes the well of ideas is dry. That's okay. Do it anyway. Write when you can. Play when you can. Do it for the love of the game, and some kind of success will follow. Just maybe get a day job, too. -Gus Mastrapa wonders if he's too old to compete with the youngsters in online shooters. This is a great piece, ringing with truth. When I was a teenager, I put hundreds, if not thousands of hours, into Quake II Capture the Flag. It's the only game I've ever really been good at, and it's only because of the practice. That was a luxury I had back then. I don't have that luxury now. At the age of 28, I've accepted that I will never really be good at a game again. That's fine in single player games, in which you don't have to excel in order to complete them. But it does make multiplayer tricky. It's fitting that Gus quotes Valve's Chet Faliszek, who worked on Left 4 Dead, because I've found that as I get older, my interest in cooperative experiences like L4D only grows. It's not multiplayer that I'm tired of, which is what I thought for awhile, but the grueling competition you find in the average deathmatch. What's the point? I'm old and slow, and I'm comfortable with that. -Lately I've been playing more and more online games at sites like Kongregate, and feeling like there's a whole world I didn't know existed. For some reason I just assumed these were spammy, worthless aggregators, but it's not the case. There's some great stuff out there, most of which can be consumed in bite-sized chunks. This week's recommendation: I Remain, a point-and-click adventure set in a zombie apocalypse. It's pretty creepy. -I hate Google Buzz. Do you hate Google Buzz? Not two weeks after surgery, the splint came off and it's on to physical therapy, which in some ways is more painful and difficult than what was happening before. The therapist tells me that that elbow is the hardest body part to rehab, so that's awesome. You should see the huge scar on my arm, too. Anyway, links. -Thanks to this week's post about trying to play games while injured, I was introduced to Able Gamers, a site for gamers with disabilities. They also run the Able Gamers Foundation, a charitable organization that advocates for accessibility in digital entertainment. It's an important subject many of us probably don't think about enough. To that end, I'd also recommend the Big Red Potion podcast with guest Mark Barlet, the founder of Able Gamers. Very illuminating. -The re-launch of Irrational Games and its website has been something to see. Not only is Shawn Elliott back to podcasting, but they're releasing things like Ken Levine's recollections of System Shock 2 development. Great stuff. -I don't think I've said this before, but I appreciated the way Assassin's Creed II didn't shy away from grappling with religious ideas, to the extent where the bad guys were actually members of the Catholic church. But, as Rich Clark points out, the game mechanics undermine any real penetrating look at the tough questions the game seems to want to raise. -I don't play or advocate for independent games nearly enough -- or at all, really -- but I've been enjoying the VVVVVV demo. Not sure why I played this one when I skip so many others. Maybe it was Rock Paper Shotgun's write-up about the game, and interview with its creator. Either way, glad I tried it. The music is great, too. -I'm not going on record with a Super Bowl pick, but, like most people, I'm rooting for the Saints. But really I'm rooting for myself to drink beer and eat a ton of food. I mentioned yesterday that I've still been able to play games despite my elbow injury. My hand is free and works just fine. The only real problem with an Xbox or PlayStation controller is that, because my elbow is immobilized, I have to sort of twist in my seat in order to bring my hands close enough to hold the controller. But it doesn't impact my ability to play the games, as far as I can tell. Oddly, the only system I'm struggling with is the one allegedly for non-gamers, the Nintendo Wii. The Wiimote-nunchuk setup has one big advantage -- the cord that attaches them is long enough that I don't have to contort myself in order to hold everything. But it also has one big disadvantage, and that's motion control. 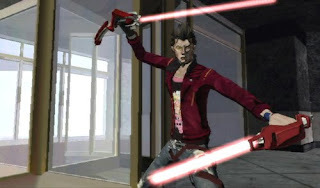 I've been playing No More Heroes 2, which controls like an ordinary third-person action-adventure in most respects: move with the analog stick, attack with the A button, target with the Z button. But because it's a Wii game, there are of course mandatory motion-controlled moves, and I'm finding them impossible to do. Specifically, Travis Touchdown can do pro-wrestling-style finishing moves to his opponents, which are both devastating and hilarious to watch. To do so requires quick movement of both the remote and the nunchuk -- move them both upward, say, or move them apart quickly. Well, this is out of the question for me. I've always found the motion sensitivity of the nunchuk to be a little hinky anyway, and without the ability to really whip it in the right direction, it's all but useless. This has resulted, sadly, in Travis diving at his opponents, missing, and ending up sprawled on the ground. I can at least perform the more common, remote-only motion controls with my right hand. I will eventually recover, but this has made me think about the plight of disabled gamers. Game inputs can be either complex and intricate, as on modern-gen game pads, or they might require strong, gross movements, as with the Wii or with peripheral-based games like Rock Band. Imagine being physically unable to play a game, or a whole genre, because the controllers don't account for your existence. Has anybody out there had to cope with a physical disability in order to play games? I'd love to hear about it. Hello! It's nice to see you again. I've been through a hell of a couple of weeks here, but I think I'm ready to get back to work. Before I do, I thought I'd share the story of what happened. Gather round. The slogan is "Mountain skiing, minutes away," and Wachusett Mountain (the inspiration for the new horror film Frozen!) really is that convenient. It's about half an hour from my in-laws' house, so I make it a point to head out there every time my wife and I visit. It's not much of a mountain -- about a thousand feet vertical, and not too many trails. Still, it's better than anything else nearby (we have some truly embarrassing ski areas around here). I went to the mountain on January 16, which was an unusually warm day, with temperatures reaching into the mid-40s on the mountain. I'm still learning how to snowboard, but that day I was feeling as confident as I ever had. I was taking on everything. I rode black diamonds with ease. I took a narrow side trail that's rarely open. And I did it all under control. It was feeling like a breakthrough. But it was also very busy, thanks to the sunny day and the lack of other options in the area. My buddy and I waited sometimes 20 minutes for a lift, and sometimes the trails were so congested that I had to pull over and wait for things to clear out. Worst of all, the thousands of ski and snowboard edges were cutting up the surfaces. By mid-afternoon, as the sun disappeared behind the mountain, the runs were bumpy and choppy. My board skipped off the surface a few times. Still, I felt good. Around 3:30, with the place in shadows and the snow starting to harden, we went back down a trail we'd done successfully a few times before. My friend is a more experienced and confident skiier than I am a rider, so he'd tend to outrun me, then stop and wait for me. He was nowhere nearby when I made a turn to my right, shifted my weight to turn back to the left, caught my back edge, and went down hard. I knew something was wrong because of the sound more than the sensation. I heard my elbow snap like a dry branch. I ended up lying on my chest, facing downhill, with my arm sprawled out behind me. I was afraid to look, imagining my arm hanging by a flap of skin. Fortunately, I could move my fingers, so I thought it couldn't be all that bad. A couple people stopped to help, and before long a competent and humorless ski patrol guy had arrived. He put my arm in a splint and bundled me onto the sled. On the way down, I saw my friend, who had stopped and taken off his skis (he told me later he had attempted to hike back up when I didn't appear after a few minutes). I sat in the mountain's clinic for about 45 minutes while we called my wife to come pick me up. I was thirsty and asked for water, but the guy said no, in case I had surgery. This would be a recurring theme -- people who weren't allowed to diagnose me, but knew exactly what was happening, would make vague and dark comments about how bad it was. "You got a doozy there, bud," said the triage nurse. "So this is the guy with the lovely x-ray," said the nurse practitioner. But the best was the x-ray technician. After I nearly passed out in the x-ray room, I said how thirsty I was and how badly I wanted some water, but nobody would let me have any in case I needed surgery. "Well, we'll see," she said, as she went into the other room to take the next picture. When she came back a moment later, she said, "Yeah, you're not gonna eat or drink anything." I was in the hospital for five or six hours, and about three hours before I got any pain medication. The doctor told me he was unable to perform the necessary surgery. We went home instead. Despite all the phone calls we'd make to various doctors over the next two days, it wasn't until the following Thursday that I actually got the surgery I needed. I spent the intervening five days with my arm in a sling, popping painkillers, and feeling the bones move around every time I did. Surgery went well, and by that weekend I felt comfortable enough to pick up a gamepad. My left hand was blown up like a balloon, and it was difficult to squeeze my fingers hard enough to press the buttons, but I made it through a couple of hours of Ratchet and Clank Future: Tools of Destruction, which felt like the perfect game to play at the time. From there it's been incremental improvement every day. At this point I can move my arm around pretty well, and use my hands for most things I need them for. There are still some things I need help with, like zipping up my coat, which never ceases to be embarrassing to ask people for help with. Fortunately, my wife has been helping me without complaint. It hasn't been all bad, but certainly much worse than when I sprained my ankle. That's the story. My apologies for the radio silence. I'm looking forward to getting back into it. Posts about No More Heroes 2 are forthcoming.